Freya with Shiloh and Greg. Freya was Greg and Shiloh's dog for a short amount of time in 2011. Freya's previous owner was most likely someone close to Greg. Most likely a family member. 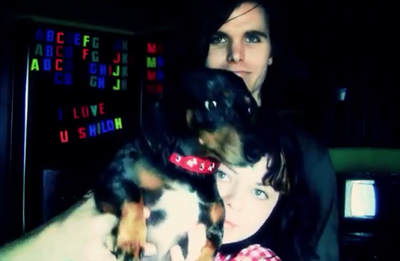 Greg and Shiloh's adoption of Freya was briefly announced in the video "I Respect Her Wishes" on June 23, 2011. After Shiloh lost 3 year of her memory, they adopted Freya together. ($ource) This was possibly Freya's only video appearance. After Freya's brief appearance in Greg and Shiloh's online life, viewers began questioning what happened to the dog. There was even a rumor that Greg and Shiloh were only dog sitting Freya for a family member. When Adrienne's email talking about her relationship with Greg was leaked, people began talking about Freya again. Adrienne claims Greg told her strange things his mother claimed Shiloh had done with their dog. "he even went as far as to tell me that his mother informed him that when they were broken up but still living together [...] Shiloh tried to force his little dog to eat her out, and the dog got scared, so it bit her in the crotch. Then he said something about Shiloh peeing on his bed and blaming the dog?" This page was last modified on 13 August 2015, at 16:47.